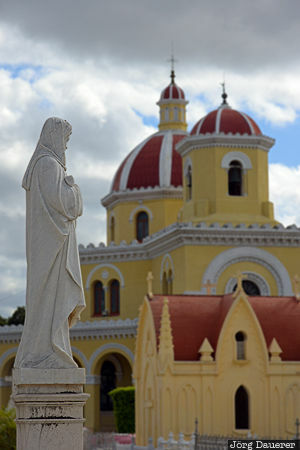 A white statue and the yellow cemetery chapel in the background at the Cementerio de Cristóbal Colón of Havana. Havana (or La Habana) is the capital of Cuba. This photo was taken in the afternoon of a sunny day in February of 2016. This photo was taken with a digital camera.